The new study, produced by Siglo Group in partnership with the Texas Land Trust Council, quantifies the value of lands and conservation easements that have been conserved by or with assistance from the Texas land trust community. The study found that the lands put into conservation with the help of Texas land trusts are estimated to provide more than $1 billion in benefits to Texas taxpayers each year. 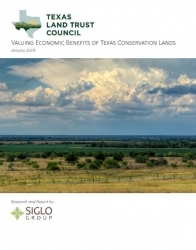 Austin, TX, March 07, 2019 --(PR.com)-- The new study, produced by Siglo Group in partnership with the Texas Land Trust Council, quantifies the value of lands and conservation easements that have been conserved by or with assistance from the Texas land trust community. Land Trusts are non-profit organizations that work to conserve special lands and waters by permanently protecting them from development for the benefit of the people, economy, and wildlife of our state. Land trusts conserve natural areas by negotiating private, voluntary agreements with property owners to leave their land undeveloped or through outright purchases. There are over 30 land trusts in Texas that offer nonprofit, voluntary solutions for land conservation. Economic values for benefits provided by these conserved lands were calculated using an ecosystem services approach. Specifically, the study assessed the more than 1.6 million acres of open space lands that have been compiled into a statewide conserved lands database by Texas Land Trust Council members and partners as of January 1, 2018. Lands were assessed in terms of the services and subsequent taxpayer savings they provide for water quality, water quantity, flood prevention, and rural economies (via agricultural production and wildlife leases). This study examined past and current research and data related to economic benefits achieved through conservation. The study found that the lands put into conservation with the help of Texas land trusts are estimated to provide more than $1 billion in benefits to Texas taxpayers each year. Of this, 47% is attributed to flood prevention and damage reduction, 16% can be attributed to supporting rural economies, and 37% can be attributed to benefits for water quality and quantity. Over the next 30 years, the protection of these services would result in over $30 billion in taxpayer savings at today’s current rates. Through a monetary valuation of the economic benefits that conserved lands provide, the results of this project are intended to more clearly articulate the value of Texas conservation lands and open spaces to decision makers. The findings represent a great step forward toward recognizing the substantial value that conservation lands bring to the Texas economy.